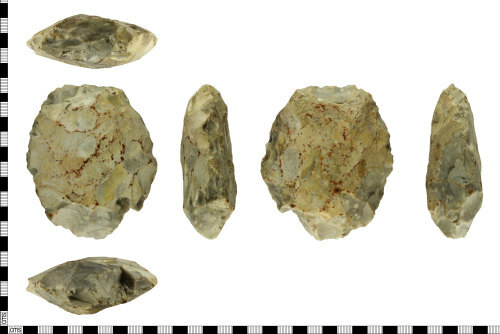 A Palaeolithic flint handaxe, dating to the period c. 500,000 BC- c.40,000 BC. The handaxe is broadly circular in shape and has been bifacially worked w. It measures 99.43mm in length, 80.94mm wide and 34.03mm thick. In colour, the axehead is creamy-white to grey and flecks of light brown, with the ventral face being more grey-brown. The handaxe has been worked equally on both sides to form an oval cross section. The dorsal (upper) face of the handaxe has been worked in many differing directions and controlled flake scars can be seen in many places, there is visible cortex. The ventral (reverse) face has many heavily abraded flake scars; it is possible that these have been water washed resulting in the creation of a smooth surface. Evidence of multi-face working can be seen around the edges of this face. The one edge of the handaxe has a slight S shaped undulating profile characteristic of handaxes of this type. No trace of the cortex remains. In total, this handaxe weighs 295.05g.